This paper looks at the digital native-digital immigrant model presented by Prensky, addresses some of the nuances of each group, and proposes the addition of another group to describe many of the non-users of technology we find throughout education. Suggestions to assist faculty in integrating appropriate technologies into their teaching are provided. Nach einer Literaturübersicht zum Thema digital natives vs. digital immigrants werden Auswirkungen auf die Bildung betrachtet und eine zusätzliche Rolle des digital tourists eingeführt. Diese Metapher vermag mich aber nicht zu überzeugen, denn mir fehlt sowohl die bei normalen Touristen vorhandene Freiwilligkeit und das beim Reisen in neue Länder empfundene Vergnügen bei digital tourists. In 2001 Marc Prensky presented a model addressing the differences between current students and their teachers. The purpose of this article is to address some advanced reflections on the models and discuss cultural implications for the role of students and teachers. It is a conceptual paper, which is based on a substantial literature review. 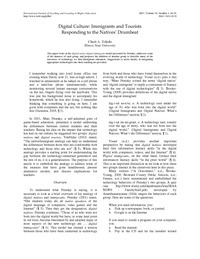 Starting from an outline of Prensky's analogy of digital natives and digital immigrants the author addresses some of the nuances of each group, e. g. different approaches to describe the behavioural patterns of digital natives. Toledo accentuates that young people who grew up with digital technologies tend to have a different way of process information compared to previous generations. This difference produces a gap between the teaching styles of the instructors and the learning styles of their students. Toledo uses an interesting analogue for this cultural gap: digital natives use digital as their first language while digital immigrants use digital as second language. As technology is becoming an ubiquitous constituent of daily live, this gap has strong cultural implications: While traditionally educators assist students in the assimilation process to become viable members of the society, now with the increasing role of digital technology the majority of students are more familiar with the new social norms than most of their teachers. How do teachers react to this change? Many teachers behave as digital immigrants, as they are motivated to become more digital native-like, but keep their immigrant's "accent". For example they deal with digital information as they did with print information (e. g. edit documents on a hard copy rather than on the screen). The strength of this interesting article is that it takes up the very popular and maybe overused analogy of digital natives and digital immigrants, scrutinizes the underlying assumptions and comes up with sound reflections on cultural implications. The extension of the model by a third category (the digital tourist) is interesting, but misses out at the end of the article. Also the implications of teachers could have been elaborated deeper.